I took yet another trip to Fairfield Hall for the bizarre, laugh out loud, Oni. Mochinosha Puppet Company specializes in shadow puppets by Seri Yanai. Beautifully hand-crafted using cardboard and inspired by Japanese folklore, the puppets and performers share tales from Old Japan. Seri and her partner use a screen made of what appeared to be drum material and simply a spotlight to capture the tales and suspend the audience. What you don’t know about Oni is that it is full of Shunga, or old Japanese erotica, modern renditions of old tales, by two witty and very entertaining individuals. The entirety of their tale revolves around the 3cm Issunboshi and his many misadventures and storytelling. Most of the show had me either laughing out loud or in disbelief at the dialogue. Oni was just plain entertaining. It was intimate, well performed, fascinating to watch the incredible detail in the puppets, and just overall a feel good show. I don’t want to say too much about the show, as I think the description tells just enough and allowing the experience to happen made the show that much more entertaining. I feel like this is the type of performance that is slightly different for each audience, which is another perk of the show. If you want something a bit on the fringe, this show is for you. Oni continues at the Fairfield Hall this weekend. I am excited to check out Roller Derby Saved My Soul and James and Jamesy tonight! 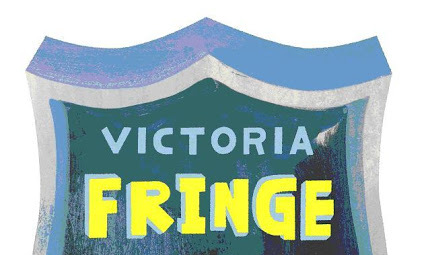 Happy last weekend of Fringe! Yesterday afternoon, I took a venture to Selkie Tales. I had heard a lot of word on the street about this Scottish duo, so I was very excited to see the hype myself. I always find it inviting when performers are there to greet you as the audience takes a seat before the show. It sets up this feeling as if you are a part of the show and it’s more of an experience rather than a performance. Selkie Tales is exactly what the title implies. That is, a few stories, one of which includes a Selkie, told by two people. The atmosphere was that of a bedtime tale told by your favourite childhood babysitter complete with costume changes and various set pieces to aid your imagination. Their performance leaves a lot to be imagined, but the simplicity is key to the whole piece. They take you to the sea, on a boat, deep underwater, and yet you feel as if you travel with them the entire time. They are charming performers and with the aid of some acrobatic tricks, the entire show is quite a pleasant experience. Selkie Tales brings to life the folklore of Scotland and is something sweet and magical to check out this Fringe Festival. Selkie Tales by Voicebox Theatre continues from August 27th-30th at the Metro Theatre.